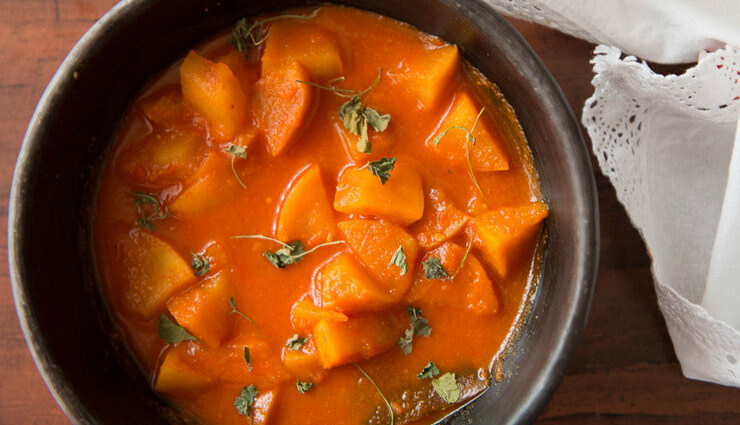 Apple Tamatar Ka Sabzi is a sweet and tangy dish made from cubed apple,infused with cinnamon in a tomato based gravy. As apples goes really well with the cinnamon this makes a perfect combination.Most of the Indian vegetarian gravies prefer using a vegetable, this dish provides a unique twist. Serve it with Phulka. * We begin making the Apple Tamatar Ki Sabzi heating a kadai with a little bit of oil and add bay leaf and cinnamon. Saute till the aroma is released. * Next, add the tomato puree and the other spice powders. Saute for about 10 minutes till the raw smell of the tomato goes away. * Add the cubed apple and give it a stir. Cook for 10 more minutes till the apple becomes mush and imbibes a little bit of the gravy. * Serve your sweet and tangy Apple Tamatar ki Sabzi with Singhare ka Cheela or Ajwain Puri to make it a complete meal.